We have worked with this team for the last three years in planning our getaway. They are quick to respond and size our needs to match with the perfect property. We always go back to them! This is an absolutely beautiful condo and we are impressed with the location, How the kitchen is outfitted with everything you could possibly need and the luxurious feeling of the entire place. Your hospitality when my wife had an emergency appendectomy followed by gall bladder removal 14 hours later was incredible. We were so appreciative of your concern and extra attention. Thanks for helping us under difficult circumstances. The flowers, card, and wine were a special touch above an beyond the call of duty. The key cards were the only thing that did not meet expectations. Easy to reach by phone. Streamlined check in checkout. Clean updated accommodations as described and shown online. Thank you. We had a fabulous stay at Big Timber Lodge! The property management staff were very helpful and responsive. Big Timber Lodge was fabulous. The house was very nicely kept and clean with plenty of room for our party of 10 to spread out and yet gather together for meals and games. The master bedroom suite, the fireplace, the back deck and the hot tub were especially wonderful. Thank you for a great week! Hassle free and easy to work with the reservations company. The property was clean and easy to find. The drive way is a bit small but manageable. Close to many different activities and trails just down the street. I would return if we had another group trip. The team was exceptionally helpful and knowledgeable about the property. Their answers to my questions were prompt and accurate. I will definitely keep them in mind when I come back out this way again! The property was very clean and comfortable. It was accurately depicted in the pictures and the description was spot-on. Great location and amenites- will definitely stay again! Staff at the office were friendly and helpful. Some of our room keys stopped working and they had us bsck in our way quickly. They gave us some ideas for attending the art festival as well. Thank you. The room was in good condition and the four of us were able to spend three nights together without feeling cramped. Garage parking was very convenient. The team that was in the office was very friendly and helpful. I was thankful that they allowed us to check in about an hour early as we had just finished the long drive and were ready to get in to our condo. They also gave some good suggestions regarding restaurants and activities in town. A team member called the day after check in for a follow up to ensure everything was good with the property. Will definitely book through Ski Colorado Vacation Rentals again! The condo was a perfect fit for our family of four (6yr old and 3yr old). Main street was a 5 minute walk, the gondola was only about a 3 minute walk. Once we parked at the condo, we never had to drive anywhere else in town, which we found to be a huge benefit given the limited parking in Breckenridge! Also, having a spot in the garage was great, a benefit that I would imagine is even better in the winter. We had a beautiful view of the mountains from our balcony, perfect for morning coffee and evening cocktails. Overall, we were very pleased with this property and plan to book again next summer! This was our first time staying in a condo. It was a great experience the people were super helpful and even called to make sure everything was going okay. You could text or call them and they were available to answer questions or give recommendations on places to go! The condo was nice and clean. Perfect place for a family of 5. It was a quiet area which made it very peaceful. The oven probably needs cleaned or updated. Otherwise we had a great stay and everything we needed was available for us! And free shuttle picks up at the end of the drive so nice perk! Unbelievable from beginning to end! We were allowed to check in a tad bit early which really helped us since we had to wake up at 3 a.m.to catch an early morning flight from Austin with a 7 year old grandson. Management office called the next day to see if we had any problems. I have never had anyone call to check on us during a stay. So very nice! Absolutely the best location in Breckenridge! Walk to everything. Two festivals directly below us during our one week stay. Condo was well equipped and we felt right at home. Great views of the mountains. We will definitely be back! The management group couldn't be easier to work with, from the texts and phone calls prior to arrival to the calls after check-in to make sure everything was ok with the unit. And our kids loved the goodie bag they were given at check-in. Overall, a great experience. Great home for our family of 6. Kids loved the hot tub and all the board games in the home. It is a quick walk to the trails of the Cucumber Gulch Wildlife Preserve and to the BreckConnect Gondola. We would definitely rent this place again. We booked this townhome just a few days before we arrived, but couldn't have been more pleased with it. Confirmation of the rental and the rental agreement was communicated clearly and promptly. Picking up the key and garage parking were a piece of cake. The only small issue was a text confirming our arrival one day earlier than booked and agreed upon. After a quick panic and double-check on our end, we called the office and were able to confirm that the text was sent automatically in error and our previously understood check-in date was correct. Great location within walking distance to downtown shopping and restaurants and minutes from the gondola (free in the summer! ), although we also utilized the free shuttle service that runs between the resorts and many locations around town. The townhome was clean and well-stocked for making meals. We enjoyed the bowling alley (free! 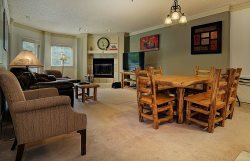 ), indoor pool, and game room at One Ski Hill (partner resort at the top of Peak 8), as well as the scenic outdoor pool onsite. The views can't be beat and the proximity to town was a big plus. The beds were very comfortable, showers hot, and plenty of room for our family of five to spread out, relax and make wonderful memories. We had a very enjoyable stay. The rental property was lovely and the town was charming. When we vacation in Colorado we will definitely come back. The property was clean, well kept, very nice furnishings and we felt very comfortable and welcomed. Lovely place. Very happy with the cleanliness and quality of the rental property. Would happily stay there again. Working with this reservation team was easy and pleasant. We did have an issue with the dishwasher. They had someone out to fix it within 30 minutes. We loved the property and the condo was in excellent condition. We will definitely stay at this place again. Everything was so very convenient. This property was in a great location. We had lots of questions that were answered quick! They gave great recommendations to do around town. The home was very welcoming and cozy. Thank you so much! It is the perfect distance from town but still feels like your staying in the woods. Privacy was great and we would stay again! We booked this place as a last minute get-away with friends to spend the weekend in Breck. The instant booking on AirBnb was great and when we arrived late Friday night, the property had an emergency line for us to call the staff to access the key. She was very helpful and patient to help us navigate to our unit and very friendly when we dropped by the office as well! Great customer service and great attitude! The condo was perfectly clean and the rooms were very nice to accommodate our group of 10 adults. The kitchen was well stocked and we loved the decor throughout the living room and all the rooms. We thoroughly enjoyed the place and its proximity to the shops/restaurants in Breck! Will highly recommend. The only limiting factor was parking, which was 0.5 miles away. It was doable in the lovely summer weather but I would book in advance and reserve parking with the property during winter season for sure! It was seemless, very friendly staff and easy to work with!